The messages pouring into Gov. Jay Inslee’s office over the Legislature’s new public-records law, Senate Bill 6617, have set a record. OLYMPIA — The messages pouring into Gov. 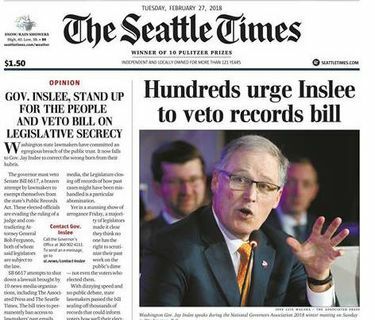 Jay Inslee’s office over the Washington Legislature’s new public-records law have set a record. As of late Wednesday afternoon, Inslee’s office has received more than 4,300 phone calls and more than 8,100 emails regarding Senate Bill 6617, according to the governor’s office. The bill, passed by the Legislature on Friday, would exempt state lawmakers from Washington’s Public Records Act, while making some legislative records disclosable. The Legislature approved the bill only 48 hours after it became public, and without giving the proposal any public hearings or floor debate. The overwhelming majority of the messages to Inslee are opposed to the bill, according to the governor’s office. 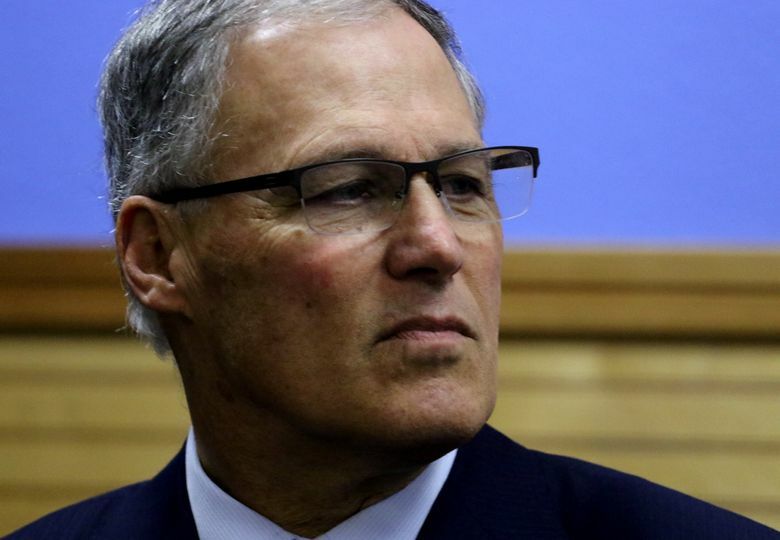 “Our constituent services staff tell us that this is unprecedented in the Inslee Administration,” Inslee spokeswoman Tara Lee said in an email. By Monday, about 540 emails and nearly 200 phone calls had come in. On Tuesday, at least a dozen newspapers, including The Seattle Times, ran front-page editorials urging the governor to veto the bill. Inslee spokesman Chase Gallagher on Wednesday morning wouldn’t say whether Inslee intends to veto the bill or let it become law. The governor has until the end of the Thursday to act on the legislation. The bill came after 10 news organizations, including The Seattle Times and The Associated Press, last year filed a legal challenge to the Legislature’s long-standing claim that it is exempt from the public records law. In January, a Thurston County Superior Court Judge ruled that legislative leaders violated the Public Records Act by denying requests for records. SB 6617 would keep private existing emails and other documents and make the Legislature its own gatekeeper when it comes to disclosing documents. The bill also makes a few types of records — such as lawmakers’ calendars, correspondence with lobbyists and final disciplinary reports — public going forward. Lawmakers have called the bill “a balanced” approach toward making more records publicly available. The Washington state Sunshine Committee, which is tasked with making recommendations to the Legislature on changes to the Public Records Act, has also urged Inslee to veto the bill. The four state lawmakers who serve on the Sunshine Committee were absent for the vote to draft the letter. A representative for Inslee’s office abstained from the vote.